Companies in the LBG Canada network, both large and small, value employee volunteering programs. Employee volunteering is an important aspect of community investment. 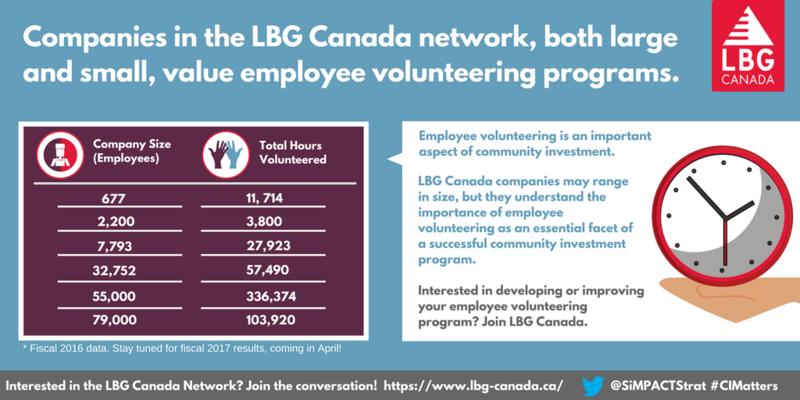 LBG Canada companies may range in size, but they all understand the importance of employee volunteering as an essential facet of a successful community investment program. Interested in developing or improving your employee volunteering program? Join LBG Canada. LBG Canada is a network of corporate community investment professionals from many of Canada's leading companies, who work together to apply, develop and enhance the use of the LBG Model and measurement framework in Canada. Participation in LBG Canada encourages companies to focus on strategy, measurement and reporting to demonstrate the business value achieved through investment in community. LBG Canada is facilitated by SiMPACT Strategy Group.